Samuel continues to work on his superb shapes and forms. His forms tend to be sophisticated and elegant. There is simplicity to his work that is so pleasing. 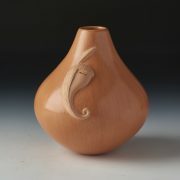 This new water jar is one of our favorite, traditional shapes. Notice the beautiful fire clouds. Samuel Manymules was born August 30, 1963 of the Bitterwater Clan for the Red Horse Nakai Dine Clan. He writes for us, “Unemployment is extremely high on the Navajo Nation. Through my adult life, I have been employed sporadically among many trades: I once made jewelry for the late Herbert Taylor, drove a tow truck for several years, and worked at an auto dealership. After dabbling in making pottery for over a decade, it is only very recently that I considered myself a potter, I am self-taught, At the moment, I consider myself more serious and engaged with my pottery. 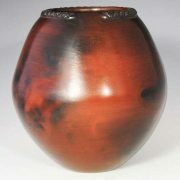 The vessels I make are of traditional natural materials. First, I gather moist pure clay from local riverbed sources, which is then dried three to four months in the sun. When dried, the resulting clumps are crushed, ground and sifted into fine powder. Temper is also gathered and processed; volcanic ash, silt, or pottery shards may be used. After hand mixing, the clay is set aside for curing. Finally, after many months of preparation, the clay mixture is ready for use. Firing is an all-day process. Cedar wood is used because it burns efficiently and high temperatures. Fire clouds happen by chance. When finished, debris, such as ash, is carefully removed. Refined pinion tree sap is then swabbed inside and out with a stick while the vessel cools. 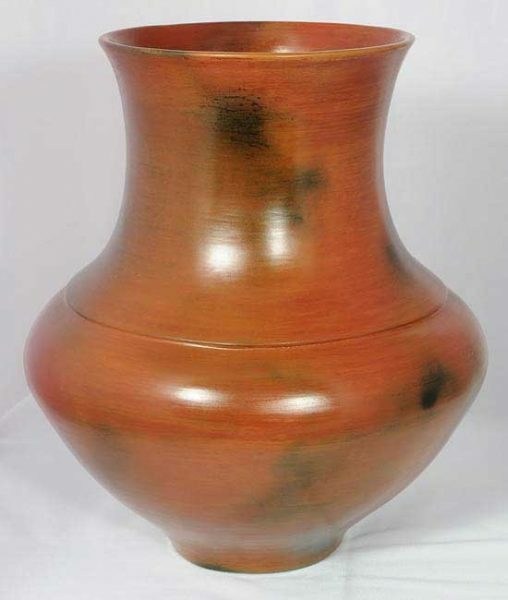 After the vessel cools, the pottery is polished with a cotton cloth to a high sheen. Samuel has won numerous awards since 2002, including a recent Judges’ Choice Award at the 2008 Heard Museum and a Blue Ribbon at the 2009 Santa Fe Indian Market. He has been awarded Blue and red ribbons at both the Santa Fe Indian Market, the Heard Museum Market, and in both 2005 and 2006 won Best of Pottery at the Southwest Museum Indian Marketplace.